It’s not easy being a toy photographer. 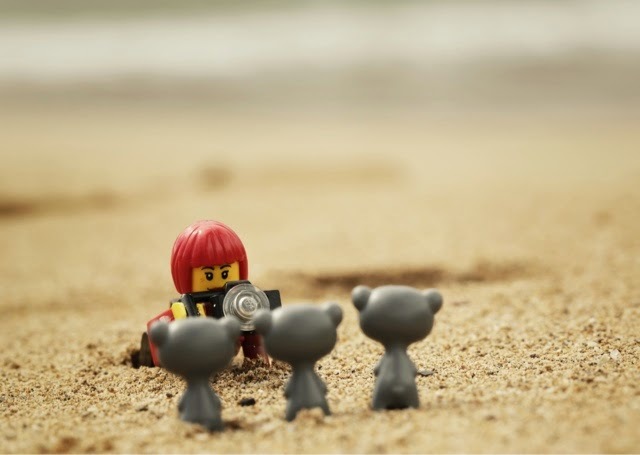 If you happen to take photos of Lego outside I’m sure you’ve had a few awkward moments. You know the ones I’m talking about, the ones where people look at you in that weird “What are you doing?” sort of way. Or how about the time you told your friends (or family) that you photograph toys and there only response was a blank look. Instead of feeling ashamed of this wonderful hobby, each one of these interactions is an opportunity to engage, educate and hopefully create a connection with a like minded individual. The trick is finding a way to connect in a way that is both accessible and informative. I’ve been rather glib when people ask me what I do, I simply respond that I take pictures of Lego. They immediately give me that blank look indicating a total lack of understanding until I whip out my iPad and show them. Generally their response is enthusiastic and we have a great conversation. After reading “Show Your Work!” by Austin Kleon I realize I have to do a better job. I need to be respectful of my audience and myself by providing an answer that better describes what I’m doing, is brief and accessible. I was considering going with “I’m a bookkeep that takes pictures of Lego mini figures in the wild.” This is not entirely accurate but it would certainly start a conversation. I’m proud of the toy photography community I am a part of. I want the world to know what an amazing art movement this is. So I am going to stop being glib and take more time to help people understand what is going on. In the mean time, the next time you’re lying on the ground and getting “that look” from some passerby, know you are in good company. Have you ever been stopped on the street and asked what you are doing? Do you feel foolish lying on the ground to get that perfect shot? How do you describe your photographic hobby to you family? A behind the scenes photo of me in action today. Serhat, thank you for sharing your story. I am glad you have found the courage and freedom to take your photos when you travel. For me these are often the most fun any way. Exploring a new place through the eyes of macro / toy photography is such fun! I hope more people find out about your work, surreptitiously or otherwise. Thanks for sharing your story. I am pretty sure that your will not be remaining in the closet much longer! But that is just one persons opinion. In the mean time your secret is safe with us! This is a wonderful post! I take most of my photos indoors so I don’t have exactly the same issues but I did recently get a snide comment from a fellow photographer at a photo meetup a couple of months ago. The comment, actually the tone of the comment, hurt but it’s not going to stop me from taking minifig photos. I always love your bog and your photos! Thanks Lyn! You are a master of the indoor shot. I wish I was with you when the fellow photographer made his snide comment. I am sure I would have had a few choice comments for him. Honestly I take photos outdoors because it is easier. I can rely more on the scenery and less on my own brains to tell a story. So my hat is off to all those, like yourself, who take such great photos indoors. And thank you so much for being a loyal reader! It’s funny because I view taking photos outdoors as “more difficult” than what I do indoors :-) So I always admire the work of you and the other photographers who get such great outdoor minifig shots. Great post Shelly! I’ve been photographing toys of all sorts for about six years now. Started with stuffed animals then it was McDonald’s Happy Meal toys and worked my way up (down?) to Lego. Toy photographers are generally a fun group and share freely, I am thrilled to find like-minded individuals and I’m in awe of some of the great work they share. My daughter shake her head often and other family members think I’m just daft… I love it; it’s fun and creative and keeps me out of trouble! Thanks Maggie! The internet has been wonderful connecting our far flung community. And yes it keeps me out of trouble too! I must say I never felt the need to come out of the closet as all my friends are just used to have a lot of plastic little friends around the table. I’m really glad you wrote this article about being a toy photographer. I get these awkward looks and people asking me all the time, what I’m doing. Your article makes me look at things in a different perspective and makes me realize I could explain myself more in detail for people to understand too. Thank you xxsjc!